Stretch, refine and align with an hour of a gentle yet energizing yoga practice. 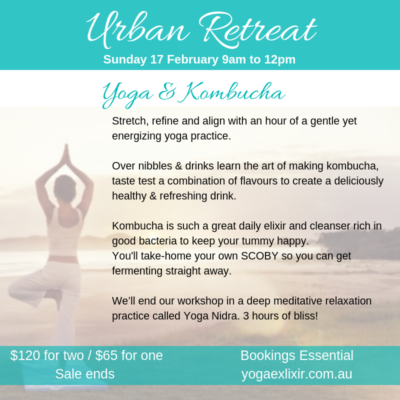 Over nibbles and drinks learn the art of making kombucha, taste testing the combination of flavours to create a deliciously healthy & refreshing drink. We’ll end our workshop in a deep meditative relaxation practice called Yoga Nidra to repair and renew. There is limited floor space, so please reserve your mat.